A 38 North exclusive with analysis by Nick Hansen and Jack Liu. 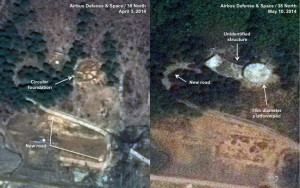 New commercial satellite imagery from May 10, 2014, indicates that North Korea is conducting a number of important construction projects at the Sohae Satellite Launching Station (“Tongchang-ri”). While it is too soon to make a definitive judgment on their purpose, one working hypothesis is that the North is building a new complex to conduct future training and launches for mobile missiles such as the KN-08 intercontinental ballistic missile (ICBM). Moreover, that hypothesis is consistent with ongoing KN-08 engine tests being conducted Sohae’s rocket engine test stand, where a probable KN-08 first stage is currently seen on the stand, possibly left there after early April 2014 tests or for use in the future. Construction of an unidentified circular facility with a diameter of 50 meters—a possible launch pad designed for the research and development test phase for mobile missiles. 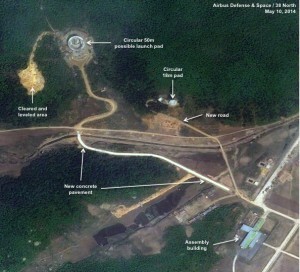 A cleared area, connected to the circular facility that could eventually be used as a flat pad for training mobile missile units and perhaps conducting launches from transporter-erector launchers (TELs). A new reinforced concrete road connecting the possible new launch pad to the missile assembly building located about 1 kilometer by road to the northeast. A smaller circular pad at a nearby lower elevation that may be designed for the use of radar or optical instrumentation equipment intended to support launches from the larger possible launch pad above it. Recent imagery also indicates that Pyongyang’s effort to upgrade the existing Sohae launch pad to handle space launch vehicles (SLVs) larger than the Unha-3 (launched in 2012) is continuing but work has slowed. That may be due to the greater priority placed on the construction projects outlined above. 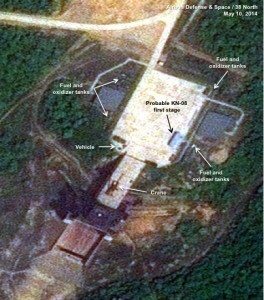 As a result, North Korea will be unable to conduct SLV tests from this site until at least mid to late summer 2014 when work should be completed. Figure 1. Overview of the Sohae Satellite Launching Station (“Tongchang-ri”) as of May 10, 2014. For all figures, click to enlarge. Image © 2014 Airbus Defense & Space. All rights reserved. This image is not licensed for media usage. 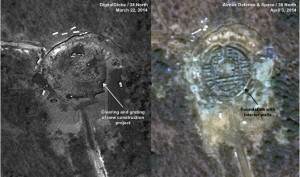 New construction projects at the Sohae Satellite Launching Station previously identified by 38 North are continuing at a rapid pace, indicating that the work is a high priority and requires the use of significant resources. Of the two new facilities highlighted before, work on the larger facility began with tree clearing and earth grading in late March 2014. By early April, a nearly circular foundation with a large number of interior walls had been completed (figure 2). One month later, imagery shows a distinct change in the facility’s appearance. It now consists of a complete circular level with an outer diameter of about 50 meters and four more lower levels on its inside resembling in some ways an open-air amphitheater (figure 3). Figure 2. Early construction of a possible launch pad. Image left © 2014 DigitalGlobe, Inc. All rights reserved. Image right © 2014 Airbus Defense & Space. All rights reserved. This figure is not licensed for media distribution. Figure 3. Mid construction of a possible launch pad. Image © 2014 Airbus Defense & Space. All rights reserved. This image is not licensed for media use. 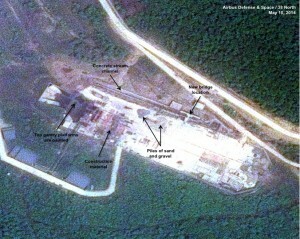 In addition, the North Koreans have rapidly paved a new concrete road leading from this facility to the missile assembly building. The first 0.6 kilometers from the assembly building were paved with concrete between early April and early May with the remainder yet to be completed. It is worth noting that only the most important roads at Sohae are paved. Construction of a second smaller facility at the base of a hill 300 meters to the southeast had started by late March. Imagery from April 3 shows that digging had begun for the trenches for the foundation and work had started on a new road. By May 10, a flat concrete pad 18 meters in diameter was present with an attached unusual wide curved road at the end of the new road to the facility. Currently this structure is attached to the west side of the circular pad. It is still under construction and it is not yet at the level of the level of the 18 meter in diameter pad. Figure 4. New possible instrumentation pad. Images © 2014 Airbus Defense & Space. All rights reserved. This figure is not licensed for media use. It is too soon in the construction process to positively identify the purpose of these new facilities. However, one working hypothesis is that North Korea is building a new complex for future training and rocket launches, possibly for new generations of mobile missiles such as the KN-08 ICBM. Moreover, that hypothesis would be consistent with what appears to be ongoing KN-08 rocket engine tests since 2013 at the engine test stand. 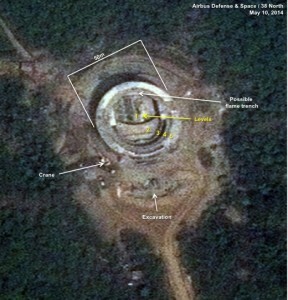 A possible launch pad (the large circular facility) that could be designed for the research and development test phase for mobile missiles. A cleared area, connected to the circular facility that might eventually be used as a flat pad area for training mobile missile units or perhaps conducting launches from transporter-erector launchers (TEL). The construction of a new reinforced concrete road connecting the possible new launch pad to the missile assembly building located about 1 kilometer away by road. A smaller circular pad at a lower elevation that would appear designed for the use of radar or optical instrumentation equipment intended to support launches from the new possible launch pad. Given the proximity and the nearly identical timing of construction, these facilities are probably related. Figure 5. New developments at Sohae. Image © 2014 Airbus Defense & Space. All rights reserved. This image is not licensed for media usage. 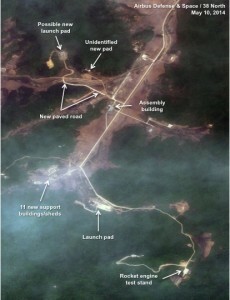 Construction on the launch pad and gantry used for previous launches of the Unha-3 SLV started in August 2013 is continuing at a slower pace than initially projected, possibly because of higher priority work at Sohae. The estimated completion date now appears to be mid-to-late summer 2014. As a result, North Korea will be unable to launch an SLV from Sohae until at least that time. Imagery from May indicates that the top platforms on the gantry tower have been painted, but the swing out work platforms have not yet been installed, since parts for them are still laying on the pad. The pad remains covered with construction materials for the gantry modifications as well as for work on the pad in front of the gantry. A new reinforced wider bridge leading to the site has not yet been completed, restricting entry onto the pad to smaller vehicles, and construction on a concrete bypass stream channel continues. (The bypass is needed to prevent erosion of the side of the pad and the bridge foundation as water rises.) There are also new piles of sand and gravel on the pad probably for use in completing the bridge and channel (figure 6). Figure 6. Construction work on the launch pad and gantry. Imagery from May 10 indicates that a probable first stage of the KN-08 mobile ICBM is on the engine test stand, possibly left there after tests in early April (the stage’s dimensions and coloring are similar to the one spotted in early April imagery) or for use in the future. In addition, a heavy lift crane—used to lift the rocket stage into and out of the stand—is seen on the ramp in front of the entrance to the test stand. There are approximately 25 tanks are just off the sides of the pad for fuel and oxidizer necessary to conduct tests. However, it cannot be determined if they are full or empty (figure 7). Figure 7. Probable KN-08 first stage seen on the Rocket Engine Test Stand. Given the early phase of construction at the site, 38 North is assigning the designation “possible” to the new launch complex, a term that describes a greater degree of uncertainty than “probable.” As construction continues, the role of these facilities will become more apparent.